Please refer to our stock # trif1 when inquiring. 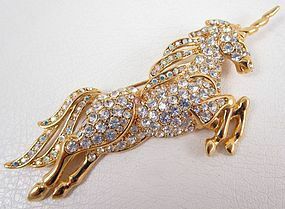 This wonderful vintage pin by Trifari measures 4 1/4" long x 1 5/8" wide. It is made from gold tone metal and has pave crystals covering the front. It is in excellent condition and is signed "Trifari" on the reverse.